Understand Different Vehicle Safety Ratings Today! It's natural for consumers to want to do the most research not just into their prospective car's features, but also how it has fared when tested for safety measures by the experts. However, this can be confusing, as there are often two different groups of ratings to choose from, begging the question: what's the difference? How Much Cargo Space is Available in the Audi A4 Allroad Quattro? The Audi A4 Allroad Quattro is Audi’s version of the versatile wagon. Sedans are designed to carry passengers in comfort without much cargo space. With consumer interest building toward a more versatile vehicle that can carry passengers and cargo simultaneously, Audi introduced the Audi A4 Allroad Quattro as a compromise between the large SUVs and the sedan. The Audi A3 is a popular compact car with the performance of larger models. This sedan is fuel efficient because of a lighter body and a 220-horsepower engine. For a more striking luxury vehicle, the sport option has bolder accents and drive selection to respond the way you want. Using an aluminum sub-frame makes the Audi A3 lighter reducing fuel mileage. What Are the Design Features of the Audi A3 Sportback e-tron? The Audi A3 Sportback e-tron is a compact plug-in hybrid with a sleek sportback body and spacious cargo volume. You can test drive the vehicle at Audi Chantilly in Chantilly, VA. Two of our favorite design features of this compact plug-in hybrid are the sport package and the heated leather seats. The sport package consists of front sport seats and a three-spoke multifunction flat-bottom steering wheel. When you're on the road, safety is a big concern. The Audi Q7, a popular midsize luxury SUV, comes equipped with a variety of technology features to help you stay safe in Chantilly. That way, you can feel confident driving in your neighborhood or on the highway. Are you considering purchasing a car, but you're hesitant to make a long-term commitment to a brand new one? The Audi Certified pre-owned program (CPO) was designed for discerning people just like you in Chantilly. There is a rigorous 300-point inspection completed on every pre-owned vehicle that is approved for the program. In the compact luxury car class, the Audi A3 remains a popular entry, prized for its sleek design features and fuel efficiency. Its performance on the road is where its long history of testing on the Autobahn really shines, providing drivers with a breathtaking acceleration rate that pairs perfectly with smooth suspension. The Audi A4 Sedan is clearing a way for compact luxury cars. 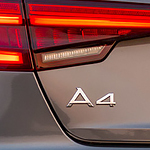 There are many that look similar, but there is only one A4. Build a relationship with a beautiful vehicle that has a high safety rating, the latest technology features, and a comfortable interior that will leave you satisfied. When you come to Audi Chantilly, you will leave with a peace of mind knowing that you just had a test drive of the perfect vehicle.